Happy Friday loves! Hope you had a great week and have some fun weekend plans ahead. I am officially done with my class so I'm planning to relax at the pool, drink lots of wine and of course get in some outfit shoots! I seriously wish so badly that I had Monday off but I only have Tuesday. Do you guys have any fun plans for your long holiday weekend?! I just wanted to share 2 easy outfit ideas for 4th of July depending on what your plans are! We are planning to bbq and go see fireworks with friends so I will definitely be styling something more similar to the second look. This red off-the-shoulder top has been on my radar forever and so has the clutch everyone is talking about! Yep, pretty much in love with everything you pick!! Have a weekend as beautiful and sweet as you are!! Such great inspiration for the Fourth! 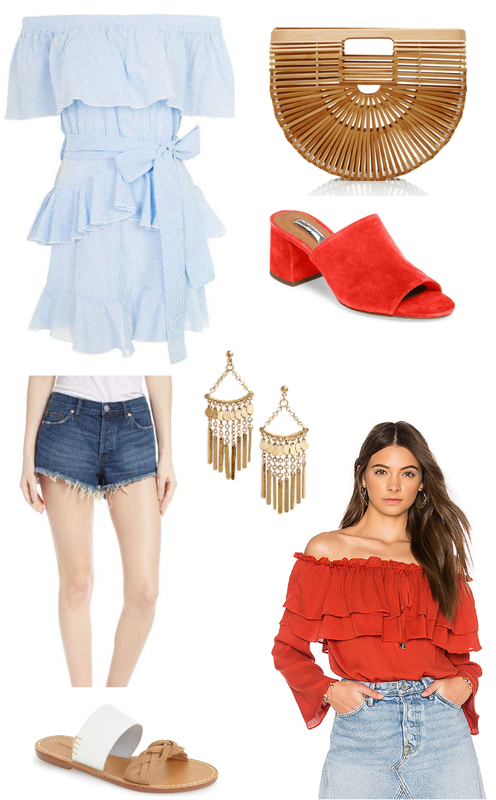 I love the ruffle dress and that red OTS top is the cutest! Have a great weekend, Kelly! Okay, so now if only everything could just miraculously appear in my closet AND fit, that'd be great, haha! Seriously though, girl, I really love all your picks and how they really do combine to make the perfect summer and holiday outfits. Thanks for sharing and I hope you have a wonderful time with the family! Those mules are incredible. I really dig that braided sandals too! How fun are those red mules?! Loving all these pieces. I love your outfit picks! I need both of these looks! That dress is so stunning! I must have all of these products, loving this inspo board! I love both looks because they are so simple yet so chic as well!